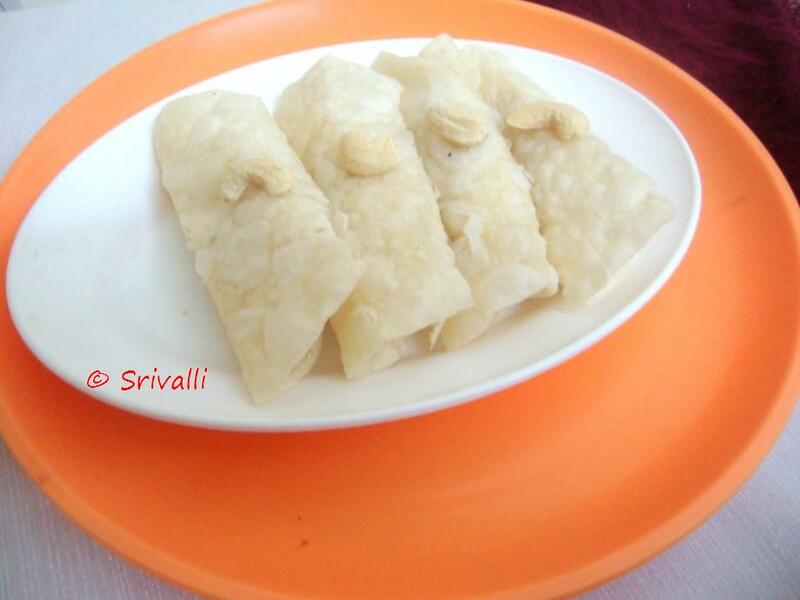 Spice your Life: Suruttai Poli - Rolled Poli | Indian Cooking Challenge for February | How to make Suruttai Poli Step By Step Recipe! While I talking to Nithya, I happened to ask her why she was no longer taking part in ICC, she sheepishly confessed that she was forced to miss it 3 times, she can't take part. Now that was really very surprising to me as I did tell her that the rule is just there, critical things that happen can't be avoided right, everybody is most welcome to join us once they are able to. She was happy and in lieu I asked her to get her Mom suggest a recipe that is traditional and will be great for us to attempt. After all I wasn't about to let her get away that easily right. She very promptly sent the recipe. Yet again she posted way ahead of time as she didn't realize she didn't schedule the time, well I might just excuse for her beautiful pictures. 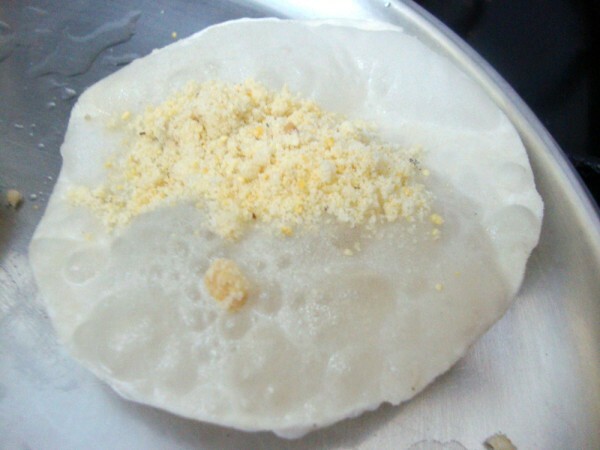 As the name suggests, Suruttai means rolled up and poli of course refers to the sweet poli that we regularly do. Though it resembles only there and the process is completely different. 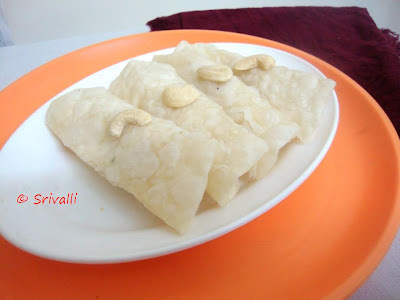 But instead of Sweet poli that we make, this resembles Kajjikayalu which has the same ingredients but a completely different method and way to make. In a small pan, heat the ghee and roast the cashew nuts first, when they start turning colour, add the grated coconut and quickly stir them. These tend to get browned very quickly. Meanwhile, grind the fried gram and sugar to a powder. 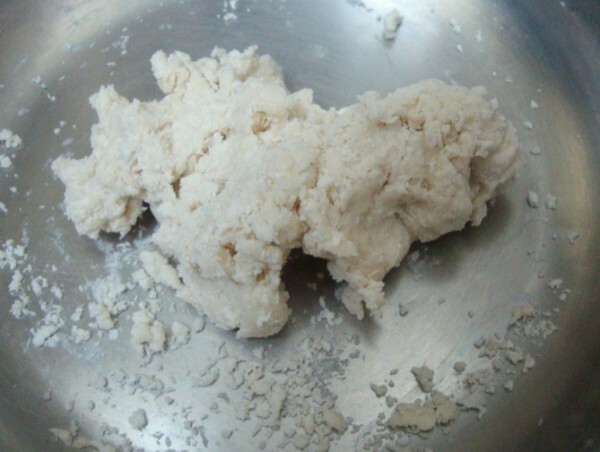 if you wish you can make this coarse or very fine. 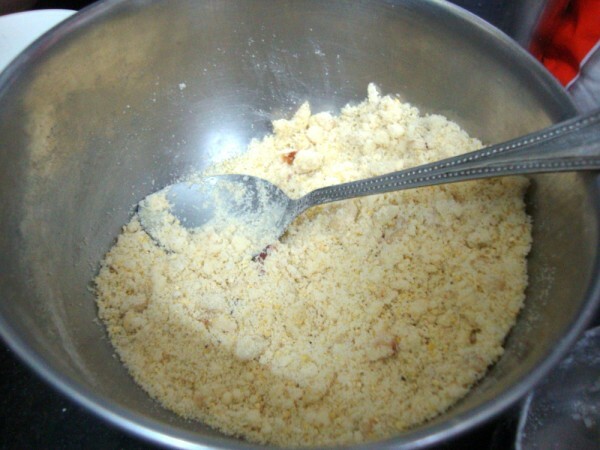 Once the done, mix the coconut cashew fried mix to the powder and mix well using a spoon. 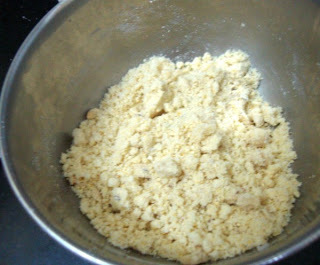 In a bowl, take the all purpose flour/ maida, add salt. 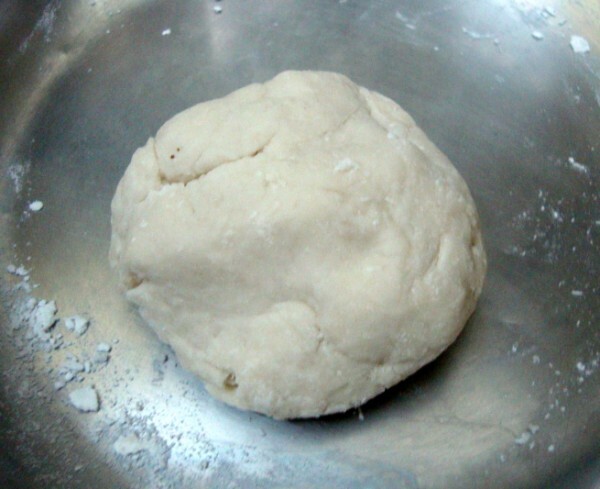 Slowly add water and knead to stiff dough. Allow it to rest for 10 mins. I didn't do this as I was in a rush. But I suggest you do it as it will be easy to roll up out. 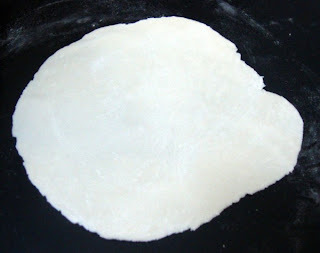 Once done, roll them to a thin disc as you would regularly do with rotis. I thought it will be pretty to have an even shape, so using a lid cut them into equal discs. 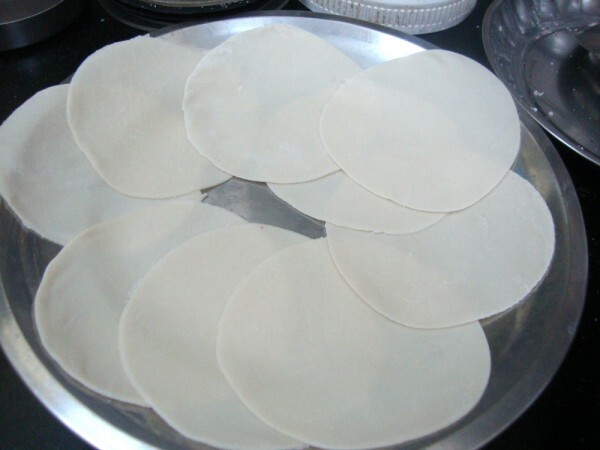 You will have to roll these quite thin so that they don't puff up as pooris. When you have all the polis rolled out, allow them to rest for them to dry up. But of course, I allowed them to rest only the it took to get the oil heated up. Remove to a plate, here where the tough part comes in. You got to immediately work on it. 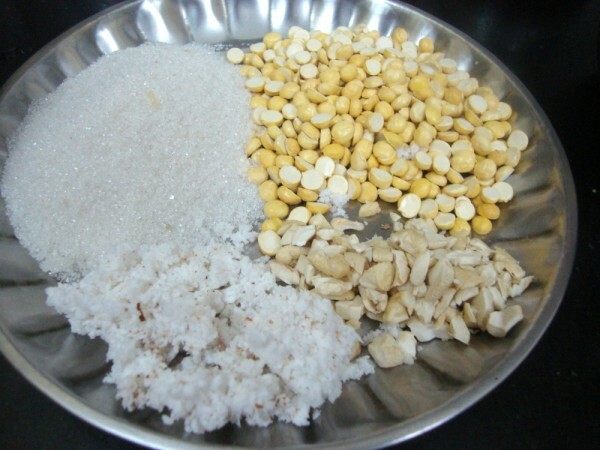 Powder the roasted gram and sugar together to a coarse or little smooth powder. Chop the cashew nuts into tiny pieces. 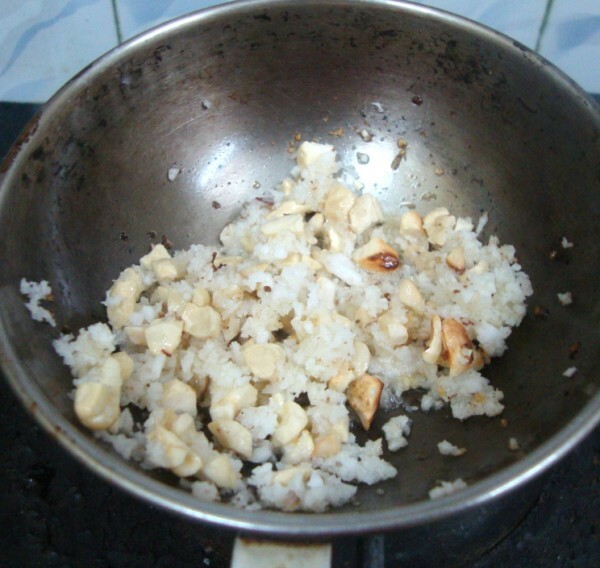 Heat a pan with ghee, roast the cashew nuts till they start changing colour, then add grated coconut. Take it down immediately. Mix all these together in a bowl and keep it aside. In a bowl, take the flour, add salt, combine well. Then slowly add water little by little and knead to a stiff dough. 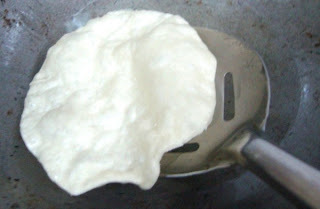 It should be of a poori consistency. Let it rest for 30 mins. Pinch out small balls and roll them out as thin as possible. The discs should be thin and you can press with fork to make sure they don't puff up. 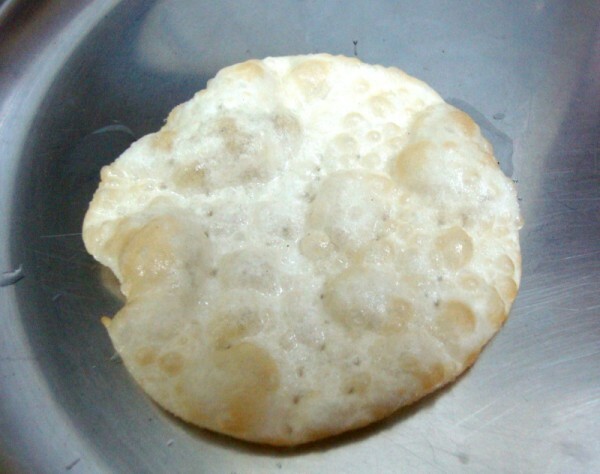 These appalam can have small bubbles here and there but should not puff up totally. After you roll them into circles spread them on paper and leave it aside for ten mins. Heat a kadai with oil just enough to deep fry. Gently drop the disc into the hot oil. Remove when the poli is almost done but not turned colour. They should be flexible and should not turn brown or crispy. Once you remove them from oil, immediately spread the filling on the papad and roll it tight and keep it on a plate with seem side facing down. The challenge in making this sweet is the speed in which you work with rolling the fried papad and handling it while it is still hot. Notes: Since I cut them into small discs it was hard to use more than 1 tsp of filling. But if you make it bigger you would use up all the filling. Kids were around when I made these and before I could even utter a word, all of them wanted those poorispooris without the stuffing. By the time I maneuvered and got to clicking these pictures I was exhausted. The pictures didn't come out well nor was I getting ideas in placing them better. I gave up. Will be making them again for a better presentation. You can check out how pretty Nithya has clicked them! To all my ICC members, please link your Suruttai Poli post to Mr. Linky.